How far along: 27 Weeks, 0 Days - Officially in the third trimester!! Baby is the size of: a head of lettuce! He's around 14-15 inches long and weighing around 2 lbs. Baby boy is now opening and closing his eyes with ease. His brain is developing at a rapid pace and is beginning to show activity. His brain is now able to control his lungs and regulate his body temperature. Grow baby grow! Symptoms: Heartburn, Braxton hicks, pressure, and normal third trimester aches and pains. Labor Signs: I can't believe it's already time to add this section into the weekly bumpdates! I feel like my first trimester dragged on and on, but since then this pregnancy has flown by. I started experiencing Braxton hicks pretty early this pregnancy. Like really early. I first started noticing them around 21-22 weeks. I wasn't even sure if it was really them because it was so early, but my doctor confirmed that yes, it was most likely Braxton hicks. Fast forward a few weeks and they started coming more frequently, especially at night. There have been a few nights where I've been having 4 and 5 and hour for several hours. After lots of water and a warm bath, the seem to subside enough for me to fall asleep. Last week (at 26 weeks gestation) I was experiencing between 4-6 and hour. They were frequent enough to warrant a phone call to my doctor who wanted me to come in and be checked just to make sure all was good. Thankfully I am not dilated, but the contractions are causing some things to kick start. It's WAY too early for anything like that, so I was sent home with instructions to stay off my feet as much as possible (easier said than done with a two year old at home, right?! haha). Things have seemed to slow down since then, thankfully. I'm still having Braxton Hicks daily, but they aren't coming as frequent as they were last week. Weight Gain: Up 8 lbs. Movement: This little boy is still a very active little one! He spends a good portion of the day kicking away in my belly. I love feeling every movement! Cravings/Aversions: Salads still sound delicious. And I could always go for something sweet at the end of the day. Missing anything: Same ole' stuff. I did find a yummy non-alcoholic wine that I enjoyed over Thanksgiving. I've tried other non-alcoholic wines and have found them all to be disgustingly sweet. This was actually really delicious. It's a Cabernet and if you're pregnant and missing wine, I highly suggest you find some of this! It's called Ariel and I found it at a local grocery store. Sleep: I'm waking up a few times a night and having to switch positions, but otherwise no complaints. Maternity Clothes: Still rotating mainly leggings and tops with sweater and cardigans. I'm hoping to make it through the rest of this pregnancy without anymore maternity purchases. I'm loving Free People (as always) because so many of their tops are flowy enough to accommodate the bump. Nursery: There is finally progress being made in the nursery! His room is painted and the crib has arrived. I'm hoping to get the crib installed this weekend and the rest of his furniture painted. We are using my great-grandmother's old dresser as a changing table/dresser, so I'm painting it to match the color of the crib. Once all the furniture is done it will be ready to decorate. Best moment this week: There have been so many fun memories of the past few weeks. We had a wonderful Thanksgiving celebration a few weeks ago with family and have doing all the holiday things since then. The holidays with a two year old is so much fun! Looking forward to: Everything about the Christmas season. Charlie Beth is loving all things Christmas this year, so it's been really fun experiencing it all through her eyes. 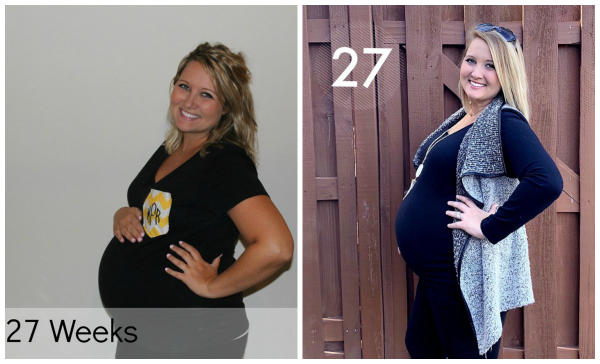 Braxton Hicks always had me nervous until I was a lot closer to my due date. Can't wait to see what you do with his nursery!